What the Heck are Snarkle Tarts? I stumbled upon the idea of creating simple silly characters from simple square shapes, I guess somehow Sponge-Bob Square Pants managed to lodge himself in my subconscious. Creating these figures was so freeing and fun, I came up with quite a few designs! I had 15 characters to name, and I knew the names had to be as cute as the paintings. Oh the pressure! Then it dawned on me. I really never intended to do this… But once the idea was in my head, it was inevitable. (Marco’s fault!) All of the character’s names would somehow refer to farts. I know. I never wanted to use the word ‘fart’. That’s why they’re called ‘Tarts’. 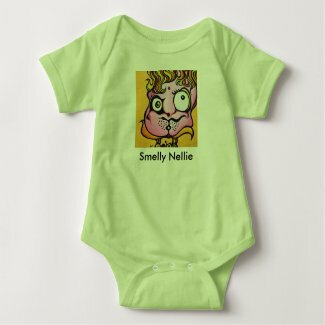 Meet the Snarkle Tarts! Hovering your curser over the photo will reveal the name. After a while, people who had some Snarkle Tarts in their kid’s rooms began to urge me to write a children’s book featuring the tarts. Now, writing a children’s book was the furthest thing from my mind, not having much experience with kids. But again, the idea stuck in my head, and I realized that since they’re names reflect farts, their story should revolve around farts. The rhymes began, and I was helpless. I had to continue with the rhymes until all the of the Snarkles Tarts had something to ‘say’ about farts. Though the poems are not perfect, I managed to write every single poem without using the word ‘fart’. Thus, ‘A Big Number 2’ was born, and I self-published the book using Blurb. 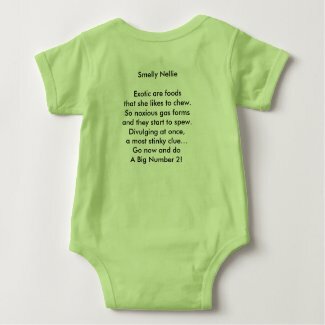 I’m really not sure where the Snarkle Tarts will go from here… but I did come up with the idea of making the images and poems available on Zazzle’s onesies! Next postArt on a Toilet?